Choose from complex, GlowPanel™, point or spiral heater models below or please contact us to select models for your application. 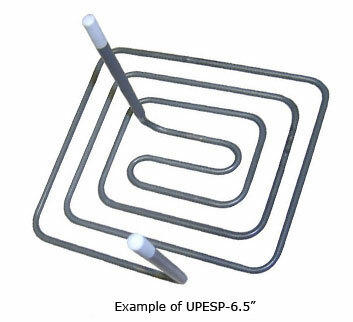 Upgrade any existing lower temperature heating element (electric heater) you may be currently using with the UPESP material heating elements that are rated to 1850°C. (Please see shapes below or inquire about any other custom elements which may better fit your needs). Contact us or call us at (513)772-0404 for more information. 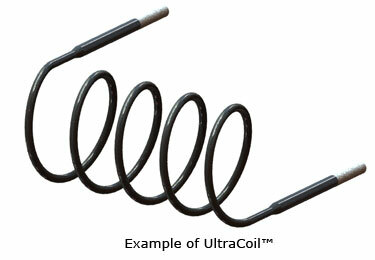 UPESP is a high power molybdenum disilicide or GAXP pancake radiator. 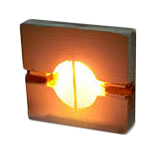 The element is supported by a patented non-reactive ceramic base plate that is provided with the heating element. Ask about our standard models. 24KW -72 KW Wall. Vertical use only. 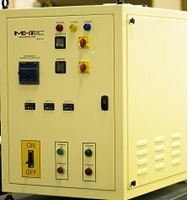 Up to 1400°C depends on model. Please review Heat-flux calculator. 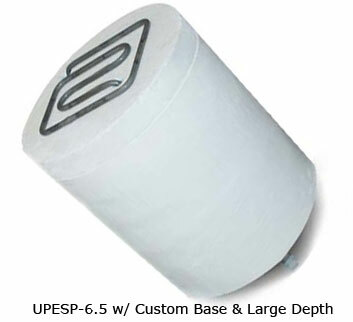 * UPESP-6.5 serves as the replacement heating element for the HP220-HIGHBO-1250 Thermoplate™. 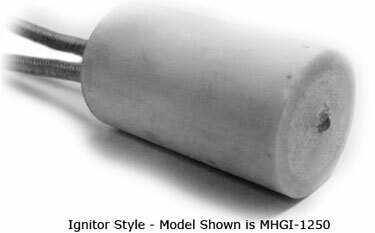 Customized length and igniter dimensions made to customer requirements. Contact MHI. *Not suitable as a hot-plate. Use as Radiative Heater Only. "I would like to thank Kevin and MHI for recommending the use ... (Petrox™) elements. These new elements have been very successful in our process. We could not perform our Preventative Maintenance on our ovens without the use of these elements. When we would check our connections we would break the ends of our elements due to the fact that they would adhere to the elements that are connected to braided straps. It's been a great help. Thanks again, Leo." Thermoplates are available, please give us a call at (513)-772-0404 for additional information.